USAWildwater.com is dedicated to bringing you the most up-to-date information on effective training techniques for wildwater racers! This section includes some of the latest available information on training, nutrition, and natural ways to peak for major races. Training ideas specifically to help racers get faster, quicker. 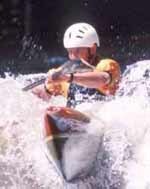 Power is a critical component in the endurance sport of wildwater racing. Wildwater is competed over a finite distance, so the winner is the person who completes the distance in the fastest time � in other words, the most powerful person. While endurance is obviously important, you still need power and speed to be successful. This training programme is intended to serve as a guideline for daily training. Chris Hipgrave shares his training plan for the 2003 Kernville World Cups. In April of 2001, French national team member Christian Processe and ICF canoe/kayak trainer Francois Beauchard visited the Nantahala Outdoor Center and conducted a comprehensive camp for development athletes and current U.S. Team members. View Chris Hipgrave's plan, culled from his conversations with Processe! Are you planning a training camp in your area?